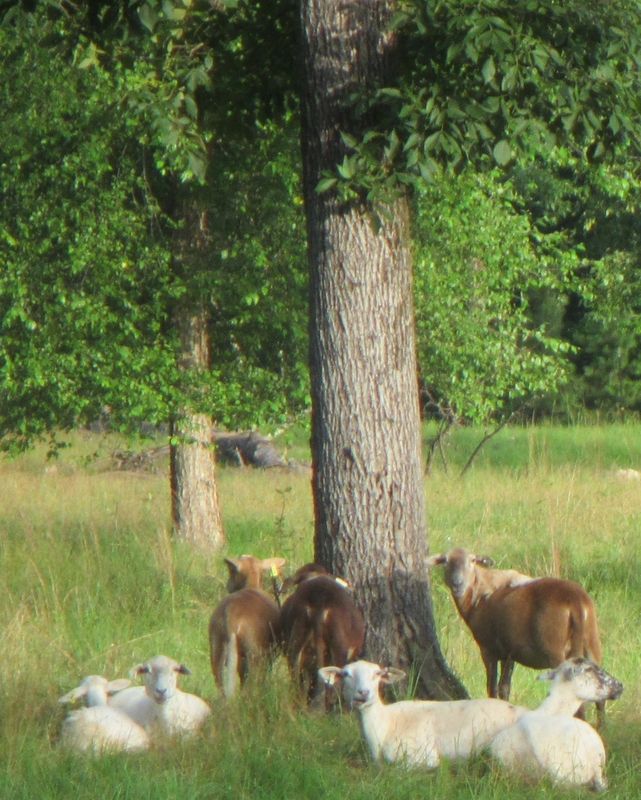 Livestock do not need to live in air-conditioned comfort as they are well adapted to both Arkansas heat and cold, said Dr. David Fernandez, Cooperative Extension Program livestock specialist at the University of Arkansas at Pine Bluff. But, providing shade and cool water helps reduce productivity losses and makes livestock more comfortable. As the days get hotter, animals spend less time grazing and drink more water, he added. Animals gain heat in two ways – conduction and radiation. Conduction is the transfer of heat from an object to an animal when they touch. Animals lying on hot ground are warmed as the hot ground transfers heat to their bodies. Radiation from the sun heats animals’ bodies. Darker-color animals absorb more heat than light-colored ones. Some animals have light-colored hair but dark skin so they get warmer much faster, he said. Dr. Fernandez said he is always amazed by the number of times he is asked “Do animals really need shade?” The answer is a resounding yes as shade reduces heating from radiation and allows heat to dissipate from their bodies. Because livestock are warm-blooded, they generate internal heat all the time. Between internal heat generation and external warming on hot days, animals can overheat. “Overheating causes animals to go off feed and increases their heart and respiration rates. Severely affected animals can become weak and unable to stand. Extremely elevated temperatures (over 107 degrees F) can result in death,” said Dr. Fernandez. Animals keep cool in a variety of ways. They reduce their activity levels and seek shade where they are often lying down. They may pant or in the case of horses and Brahman cattle, they sweat. Drinking cool water helps. “Cattle often stand in ponds to cool off. Discourage animals from this as pond water contaminated by feces from animals standing in it can transmit a variety of diseases including mastitis and several types of diarrheal diseases,” said Dr. Fernandez. In addition to providing shade for your livestock, Dr. Fernandez offers these tips for making livestock more comfortable. Keep water as cool as possible. Erect a shade over a water trough or tank. Provide access to a mineral and salt supplement, preferable in loose rather than block form. Livestock do not need electrolytes added to their water. Electrolytes are lost by humans from sweating, but most livestock do not sweat. If you must shear sheep, do so in the spring so the wool has a chance to grow a bit. Sheep with about an inch of wool are cooler than freshly shorn sheep, and they are less likely to get sunburned. Avoid working animals in the hottest part of the day. Increased activity can overheat already hot bodies and cause heat stress. Heat stress can impair weight gain and cause reproductive failure, especially in males. It can also suppress the immune system resulting in outbreaks such as pneumonia during hot weather, said Dr. Fernandez. For more information on this or other livestock questions, contact Dr. Fernandez at (870) 575-7214 or fernandezd@uapb.edu. July 6, 2015 in Research/Extension.